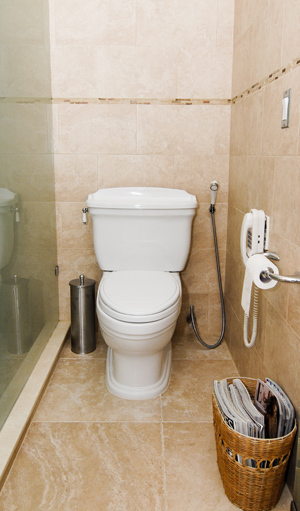 From time to time, customers inquire about have us install a pressure assisted toilet. Usually the client has dealt with low pressure flushes and is seeking a permanent fix without having tedious work done to improve the overall plumbing system. Although pressure assisted toilets perform exactly as advertised, there are a couple of things you should know about them before you make the final decision to get one. Due to the pressure used in these systems, they generate a considerable amount of noise every time they are used. The noise level is consistent with the flush that you would hear in a public bathroom at a restaurant or stadium. Sometimes buyers do not grasp the meaning of this. Even those who do, may not fully get the picture. You should realize that most public bathrooms are larger in size and the sound travels throughout that room. However, if you are thinking of installing a pressure assisted toilet in a home, know that the sound will be considerable louder throughout your home. Because pressure assisted toilet use compressed air to “pressurize” each flush, there are some dangers involved. Reports from the Consumer product Safety Commission show that pressurized systems have ruptured over 300 toilets. In effect, they have literally blown their tops. At least 2.3 million pressure assisted toilets systems have been recalled due to the danger. The report stated that 14 serious injuries have been reported. Pressure assisted toilets have their place in certain applications but they should be installed by a certified plumber who knows the tolerances of the toilet and plumbing involved. Drainmasters Plumbing fully supports water conservation and looks for ways to do so in all of our services including drain cleaning, slab leak repair, leak detection, water heater repair, and water heater installation.